Swimming was always a interesting pass time, even when it was colder James was tempted to splash right in and go around in water. Today was a bit warmer, so he had already removed his garments and mask and was now just swimming leisurely in the cold substance. Jesse was watching him unimpressed, but he knew she liked a good swim just as much as he did. "Come sister! No strange foe is going to sneak up on us" they had only been caught by surprise once, and he doubted Jesse would let that happen again....ever. Jesse gave a long sigh and then also removed her garments, including her eye patch. James moved and lowered his head a little into the water as he watched her undo her mane of hair and come into the water. He raised his head with a smile "Winter, please watch our things." Winter gave a yip and sat by their belongings, she would make sound if she saw or smelled anyone approaching. James sighed and went back to his leisurely strokes and could hear Jesse nearby also swimming. Spring was almost in full bloom, the weather shifting, but not yet letting the cold grasp of winter leave fully. As long as the water didn't freeze them, the male was quite content to enjoy this reprieve from traveling. A splash hit him in the face and coughed and blinked in surprise, looking to his sister who looked innocent enough. Smirking he sent a splash back and she shielded herself, expecting the counter strike. James laughed and even heard her give a rare chuckle. This had been a good idea after all. Sighing he showed he gave in, as the splashes were a little too cold for his taste. Jesse nodded in understanding and they simply went back to enjoying the relaxing moment, before they would have to move on from the waters and resume their traveling. ooc: Backdated to March 12th with Ash's permission! As the snow melted, it paved the way for springtime blooms. When Theodora pushed her hands into the white and brought it in to the air, she could see the beginnings of sprouts underneath. How did they know to start, when the ice still covered them? She had always been fascinated by the way the plants grew, and she could not wait to replenish her stores that had been decimated by winter. The dull gray she-wolf was making her way through the trees, trying to find anything useful, when distant sounds caught her ears. A high-pitched yip not wolf in nature, and a bit after, a splash. Knowing there was a water source nearby, she redirected her track, attempting to see what company was afoot. After not too long of travel, the trees gave way to the water, where two shapes appeared to be swimming. On the bank, a pile of belongings appeared warily guarded by… a fox. Surprise glittered on her face at the sight, immediately summoning a smile. Perhaps it was their similar size and shape to baby wolves, but Theodora could not help but find them quite cute, though she did not know how a fox would feel about that descriptor! As alert as the creature was, there was no point in trying to hide—it would have already known she was there. Heart thumping in her chest as it always did when she first made an acquaintance, Theo steeled herself with an intake of thawing air, lifting a hand in a friendly manner as she stepped out of the tree line. “Hello,” she called softly, nervously, both to the guardian fox and the two of her kind. Her stance was as non-threatening as she could manage—some wolves did not appreciate surprise company, after all. Winter gave a yip at the stranger's presence, perhaps a moment too late, since she had already offered a greeting. James sighed and quickly got to shore, getting his mask on as fast as he could. He could hear Jesse do the same, to get on her eye patch. Though Jesse was not as ashamed to show the scar's on her back, he knew she did not like people staring at her missing eye. As for him? He hated when the scars on his face were seen by others, most often followed by pointing and whispering. Hoping this stranger would not mention the marks he rested his arms on the bank of the river and let the rest of his body kind of float in the wet substance. Jesse got fully out, perhaps not in the mood to swim in front of someone unknown. That was fine as well, each sibling had their own range of comfort and accepted that as easily as they accepted breathing. Focusing on the stranger, he noticed she was female and smiled "Hallo" he offered, finally returning her greeting. 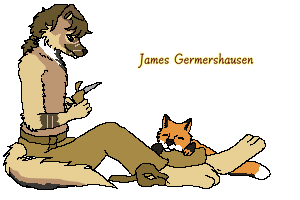 "I am James, that is Jesse, and the fox is Winter" he motioned to each party member as he mentioned their names. Winter gave another yip and wanted to cower, and since Jesse was the only one present on land, she moved between the stern woman's legs. James chuckled and sighed as he finally left the water and started drying himself off. Theodora felt a bit awkward as she appeared to have ruined her company’s fun—they both vacated their swimming hole, eagerly dressing as though they did not want her to see what it was beneath. The male put on a mask, the likes of which Theo had never seen before, and the woman an eyepatch. Wherever they have been, it has not been without its scars. As battleworn as they appeared, neither of them seemed aggressive towards her, noticed the pale woman with relief. Even better, the masked one called out to her, and his voice seemed quite friendly. He even offered up their names, though Theodora felt a bit of shame over scaring the adorable fox. It was quite unusual, for her at least—normally she was the one scared of everything. “Sorry to interrupt you all, James, Jesse, and Winter,” came a polite rejoinder, and she gave a weird half-curtsy as though to impart how little of a threat she was. “My name is Theodora. Is it okay if I come closer?” With as fearful as the fox was, she did not want to give them any reason for concern. After all, she was the interloper here, and it was her own desire for some social company that had disrupted their afternoon. From the distance she maintained, it was hard to tell much of the duo except their strange implements, though they both appeared stronger and taller than she was. The male, the taller of the two, still maintained an air of friendliness despite his countenance being hidden. Quite a talent, that. James looked to Jesse, who shrugged at the query that Theodora put forth to come closer. That was as close to a yes that he thought he would get from his twin and he smiled happily as he faced Theodora again "Sure!" he answered and his tail wagged slightly. He himself did not mind others being close to his person. Jesse was a bit more on guard and did not like strangers being too close to her. So it did not surprise him that his sisters hand went to her sword even when she herself had shown that she didn't care if the other female came closer. Rolling his eyes a bit, he otherwise ignored the action, knowing that was just a natural action for his sister to make. Winter moved a little, watching the stranger with curiosity and James chuckled lightly at the fox's actions. His own green gaze went back to Theodora and he scratched his cheek "What brings you to this area?" he asked in curiosity. He and Jesse were on their way to a close by pack, and had decided to swim a bit as they traveled. As for Theodora, he could not instantly figure out why she would want to come this way unless she too was interested in the pack land that lay nearby. If that was indeed the case though, he may offer that they travel the rest of the way together, even though he knew that would make Jesse mad. If not, then he would hear an interesting story he was sure was exciting in its own way.